View our Aromatherapy selection including Hive Of Beauty - Solutions and Natures Way Carrier and Blended Massage Oils. The Solutions Essential Oils are presented in amber glass bottles with specially designed droppers and tamper evident closures. In addition to descriptive bottle labels, a colour coded (top, middle, base) name label is also provided on the top of each bottle for easy reference when looking to select an essential oil. 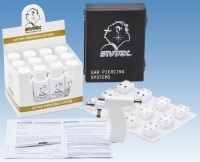 View Ear Piercing Starter Kits, Ear Marking Pen, Care Lotion, and Crystal, Gold Plate assorted Balls and Studs from Studex.